Convento is an unusual experimental film that conjures the free-floating aura of a dream, only without the stylized, hyper-symbolic imagery that we generally associate with films attempting to convey dream states. The director Jarred Alterman has, in fact, taken the opposite approach: His compositions are gorgeous and surreal in their plainness and rational tactility. Convento captures the casually reassuring pleasure, as well as the potentially disconcerting oddness, of seeing something commonplace anew. The film follows the Zwanikken family, mother Geraldine and brothers Christiaan and Louis, as they farm and initiate a variety of art and agricultural projects at the Convento São Francisco de Mértola, a vacant monastery in Portugal that they’ve inhabited since leaving Holland over 30 years ago. 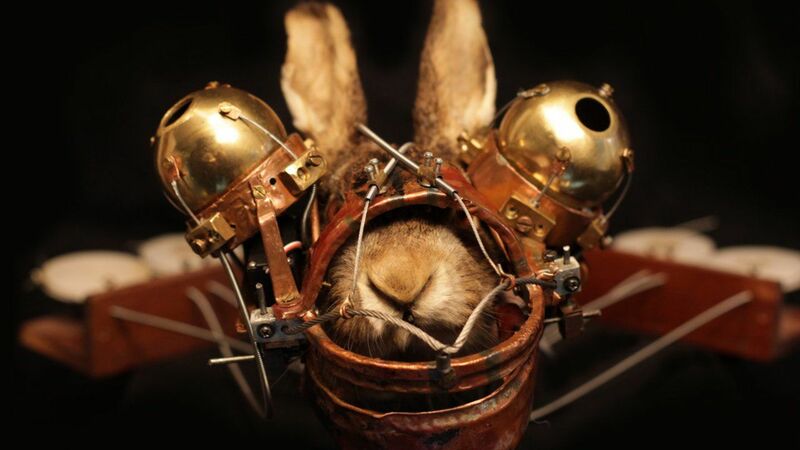 Christiann, a “kinetic artist,” fashions animate sculptures from the parts of discarded electronics and the skulls and bones of long-dead animals, while the shy Louis farms the land and tends to the living animals. Geraldine, once a promising ballerina, cooks the food and collaborates with her boys on a variety of other experiments with landscaping and photography. The father, we eventually learn, died sometime ago. Convento isn’t a formulaic documentary dryly reciting the tribulations that led a family to a bohemian life in a gorgeous and remote historical property. Details are spare and obvious questions, such as inquiries into the financial circumstances that afford the Zwannikkens the privilege to live among themselves free of the constraints that dog most of us (such as the necessity of maintaining conventional employment), aren’t explored. Alterman’s film is more like an audio-visual piece that exists as a compliment to the grand-art organism that the Zwannikkens appear to be intent on creating on the land of their once desolate home. For long stretches of the film we watch Christiann’s kinetic sculptures crawl across the vast landscapes. Some of the creatures serve tangible purposes, such as helping with irrigation, while others exist primarily for their aesthetic value. Christiann’s creatures (and that’s the proper word) often occupy the most fascinating portions of Convento, as they most completely embody Alterman’s ambiguous fascination with the family’s attempt to initiate, in their way, a kind of resurrection, both of the abandoned land as well as of the discarded junk, which may partially be their way of grappling with the father’s death. The father, only directly mentioned in a few snippets of home movies, haunts the entire film; and the creatures, which look like robotic prehistoric insects, are oddly gorgeous, Frankensteinian testaments to the beauty and threat of destruction that coexist in everyday routines. There also stretches where we watch a large wheel that has cleverly been refashioned as a tool for irrigation. There are interludes in which industrial sound effects and vaguely detectable voices are layered over the images so that Christiann’s creatures appear to be telling us something. There are more explicable moments of the family working and cooking, and there are also scenes in which a beautiful woman dresses as a robot. Much of this would appear to mean little apart from its right to exist as a whim of its creators, while other images linger as potential portals into the family’s buried hurts. There will be a part of the audience who’ll have to suppress the urge to tell these hippies to go and find real jobs and real problems—a thought I admit to entertaining during Convento‘s more tedious stretches, but the film justifies its indulgences. Convento is unsettling and strangely reassuring, as it takes a certain bravery, not to mention conviction, to live lives as odd as those portrayed here, and Alterman ultimately allows us to grasp the beauty of that bravery.